Campers love sleeping comfortably as they wait for the day to break to experience another day full of adventure. In areas with low-temperature ratings, they need to buy a sleeping bag that can keep them warm, protecting them from the extreme weather. 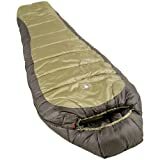 The Coleman North Rim 0 Degree Sleeping Bag has great heat retention ability. Therefore, it can offer all the warmth plus comfort required in temperatures as low as 0 degrees Fahrenheit (-18° C). This is one of the best sleeping bags to buy for use in the cold temperatures as it also has a ripstop polyester cover that is water resistant. Consequently, you never have to worry of your bag getting soaked. Moreover, the bag can fit people of large frames. It also has additional space for your feet provided by its box foot shape, unlike bags with the traditional mummy shape. Whenever you want to go camping or hiking in cold temperatures, you can trust me that the Coleman North Rim 0 Degree Sleeping Bag shall give you a comfortable time. An overall good value for money. If you are a casual camper and go camping in cold season, this is the one you have to consider. Mummy-shape and solid insulation make the bag keep most of the warmth inside. Extra comfort is created by box-shaped foot area which is not featured in some other mummy-shaped sleeping bags.